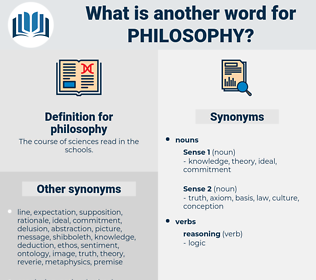 What is another word for philosophy? The course of sciences read in the schools. vision, spirit, reasoning, mentality, notion, perspective, belief, attitude, purpose, viewpoint, thought, premise, understanding. 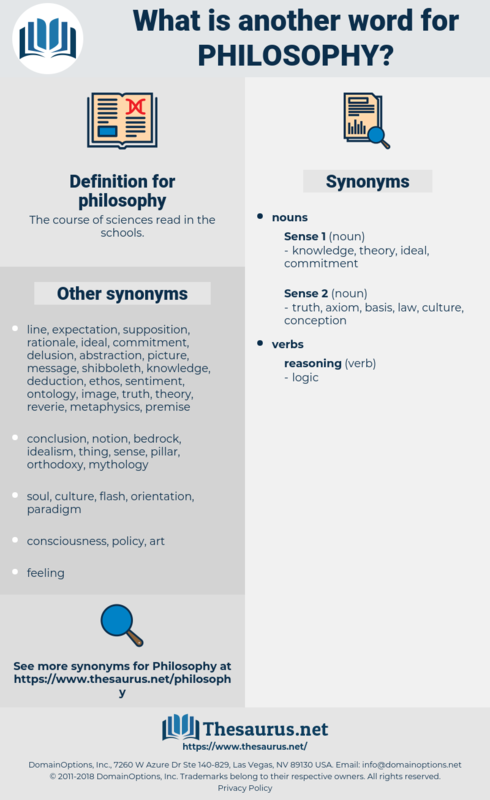 philosopher, thinking, ethos, ideology, conception, stance, mindset, design, policy. If I have said thus much in this place concerning natural philosophy, it has not been without good reason. What a profound bit of philosophy in three lines! metaphysics, esthetics, aesthetics, epistemology, law, axiology, transcendentalism, aetiology, legal philosophy, transcendental philosophy, etiology, moral philosophy, ethics, dialectic, logic, jurisprudence. liberal arts, arts, belief, humanistic discipline, humanities.